Provide comfort for the family of Quinton Parks with a meaningful gesture of sympathy. Quinton Thurman Parks Sr., 55, passed away Thursday, December 20th, 2018. He was born May 11th, 1963 in Easton, Pennsylvania, son of Johnnie and Sylvia (Wright) Parks. Quinton was an accomplished artist and was the founder and owner of Uprising Art and he took a lot of pride in his artwork. Quinton served in the United States Air Force, In addition to his parents, Quinton is survived by his wife, Muriel Parks; his five sons, Anthony Parks, Quinton Parks Jr, Quante Parks, Lequan Parks and Quay Parks; five grandchildren, Avery Parks, Kingston Bruin, Anthony Parks Jr., Bri’elle Parks and Quaylon Parks; three sisters, Michelle Parks-Robinson, Vernadine Parks and Carolyn Stonewall; two brothers, Phillip Parks and Christopher. He was preceded in death by a granddaughter, Ayanna Elizabeth Parks; and brother, John Douglas Parks. 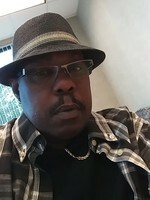 There will be a memorial service held at a later date to honor Quinton’s memory and legacy.Memorial contributions may be directed to the American Kidney Fund, 11921 Rockville Pike, Suite 300, Rockville, Maryland, 20852 or online at www.kidneyfund.org. To plant a memorial tree in honor of Quinton Thurman Parks Sr., please visit our Heartfelt Sympathies Store. We encourage you to share your most beloved memories of Quinton here, so that the family and other loved ones can always see it. You can upload cherished photographs, or share your favorite stories, and can even comment on those shared by others. 0 trees have been planted in memory of Quinton Thurman Parks Sr. I wish to express my deep sorrow for the death of such a young person as Mr. Parks. Gone much too soon. May God mend your broken hearts from your loss (Psalm 34:18). He will grant you relief from your grief. Under His government, you will enjoy complete freedom from pain and death. Jesus taught us to pray for that wonderful day at Matthew 6:9-10. Here is the link to a video that has brought me much comfort and hope: https://www.jw.org/finder?srcid=share&prefer=content&applanguage=E&locale=en&item=pub-imv_4_VIDEO&docid=1011214. I sincerely hope it will help you as well. Please accept my deepest sympathy. Philippians 4:6-7; Psalm 37: 11, 29.